Firefighters on Tuesday evening rescued two people from the water near the Berkeley Marina after their boat capsized. At about 4:40 p.m., a good Samaritan reported seeing a capsized boat near the marina, U.S. Coast Guard officials said. Berkeley firefighters and police officers, along with Coast Guard officials, responded to the area to assist with the rescue. A 29-foot Coast Guard rescue boat arrived on scene at 5:03 p.m. and was able to pull the victims, two men, from the water. Emergency crews at the pier treated the pair for hypothermia, as the water temperature at the time was 57 degrees, according to Coast Guard officials. The Coast Guard recommends that boaters dress for the water temperature and not the air temperature. 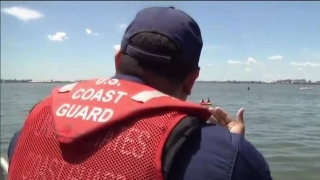 Additionally boaters should wear a lifejacket at all times, Coast Guard officials said.